For team offsites, board meetings, depositions, retreats, classes, community meetings, and more! Your team takes a ferry from downtown Seattle, and in 35 minutes everyone is a world away. 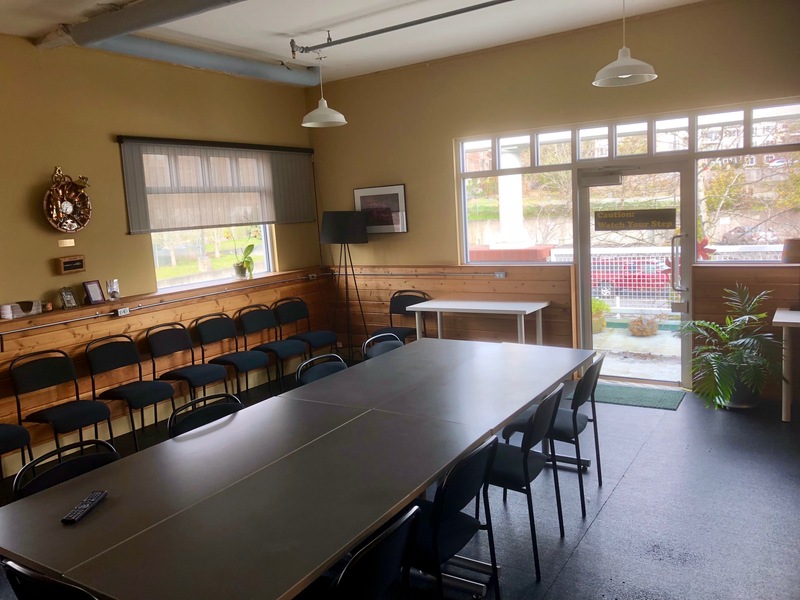 Nested in a coworking space on Bainbridge Island, a 20’x20’ classroom-sized media room seats up to 30 comfortably and can be set up for roundtables, classes, receptions, or presentations. 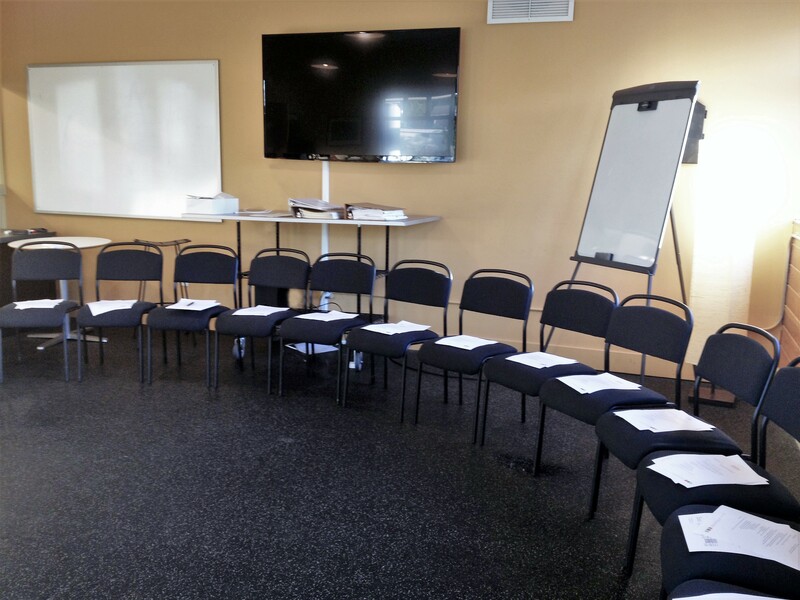 The Event room is our classroom-sized private space for your team. Natural light pours in from windows on three sides, and a door opens to a private deck for fresh air or to host parties and barbecues during beautiful warm weather days. A dedicated ductless heat pump heat/cools the space to your comfort. You get plenty of visioning and brainstorming space with a large wall-mounted whiteboard plus a moveable whiteboard/flip chart tripod. A large monitor connects to your computer for slide presentations or video screenings. Fiber-based wi-fi is included for all participants. Coffee and tea is available in the break-room/kitchen. We can also arrange in-room water/coffee/tea service for a small charge. Four on-site restaurants offer Japanese, Indian, Mexican, and Mediterranean dishes, and can arrange delivery if you need to stay heads-down. Or, take a 10-minute walk and eat out with a waterfront view. You may also bring in your own food and beverage. 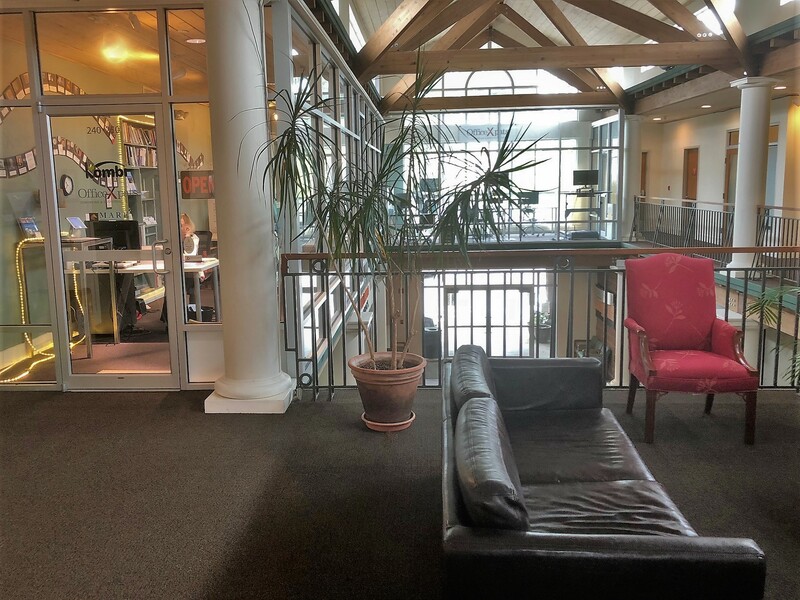 The coworking space, OfficeXpats, is in the Bainbridge Pavilion, just a 15-minute walk from the Bainbridge ferry, and a 35-minute boat ride from downtown Seattle. You can arrange with us to pick up four people at a time. For those who arrive by car, there is plenty of free parking in the Pavilion lot. The coworking space is on the second floor, accessible by stairs and an elevator. The Event room is toward the back of the space. The space is open and hosted during business hours (8am-5:30 pm M-F) and available by arrangement for evenings and weekends (make sure you speak to someone to arrange for after-hours staffing). All reservations must include time for set up and teardown. Please inquire for details about staffing. We can set up tables and chairs to your preferences, and you can feel free to move this around as you see fit. For cleanup, trash should be placed in bins and we will take care of the rest. Give us a call, 206-780-2177 to explore your options or ask questions at any time. If you already have a date set for your event, check our calendar and be sure that the Event room is available. If a short meeting is already booked on your day, we may be able to move it (feel free to ask). When you are ready, go ahead and create an account, then reserve the Event room for your team event. We can also help you find tours or adventures to supplement your time on the island!